United’s Polaris Lounge at LAX sets the standard for a business class lounge, with excellent food and drink, great service, and comfortable seating. The lounge is located in Terminal 7 at LAX on an upper floor. Follow the “Polaris” signs in the concourse and you’ll come to a small entryway and elevator that will take you up the lounge (4th floor). Note that distinction. If you fly United from London to Los Angeles in Polaris business class and are connecting to, say, Seattle, you will have access. But if you flew Air New Zealand business class from London to LA, you will not have access to the lounge upon arrival. But if you were flying the other direction, you would have access whether you were on Air New Zealand or United. I spent five hours in the lounge and am pleased to report that it never got close to filling up. United has five daily “Polaris” departures from LAX (Tokyo Narita, Shanghai, London Heathrow, Sydney, and Melbourne). These flights are spaced out such that the most departing United business passengers you’ll see is 96 since the Melbourne and Sydney flights (both operated by 787-9s) go out about the same time. 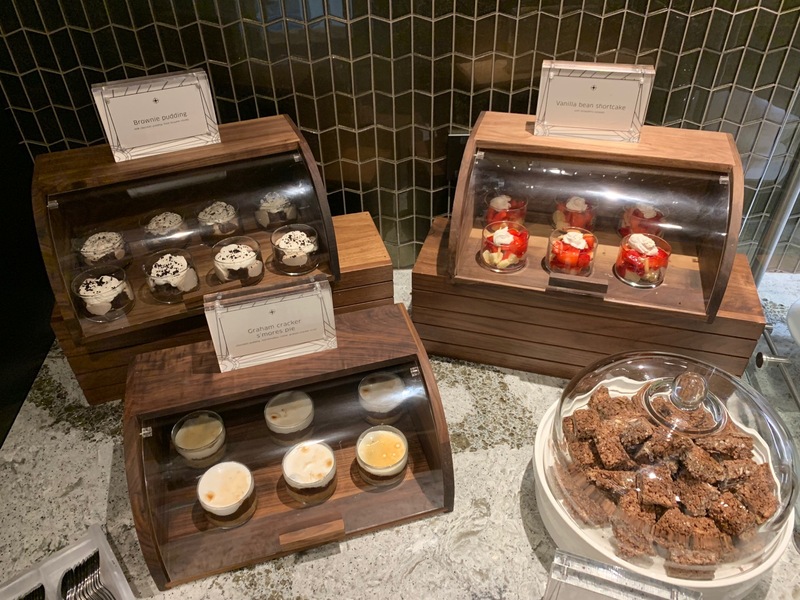 It seems connecting international passengers may not be aware of the lounge yet and passengers departing on Star Alliance partners in the Tom Bradley International Terminal are opting to use the Star Alliance lounges there. Seating resembles other Polaris lounges in the network, with oversized little suites that include a comfortable chair, worktable, lamp, and plenty of power ports. The beautiful four-sided couch in the middle of the seating area acts as a seating centerpiece. The terminal has a rotunda that the lounge was built around. On one side of the rotunda is the buffet while the other side has a wine cabinet and seating. You’ll enjoy great apron views from the lounge. The true centerpiece of the lounge is the bar, which stretches around the heart of the lounge and offers a wide selection of hand-crafted cocktails, beer, wine, spirits, and barista-made coffee. Each United Polaris Lounge offers 2-3 specialty cocktails unique to the lounge, which I always attempt to sample. I tried a cocktail called “Let’s Rumble” which included spiced run, lemon, pear puree, simple syrup, and Amaro Nonino Quinessentia. It was a light, sweet cocktail. A special shoutout to Jaymond, one of the bartenders. He was a pleasure to speak to and a perfect fit to a lounge that will focus not just on the amenities, but great customer service. As a subtle reminder that no one wants to hear your loud mobile phone conversations, two phone rooms are available where you can yack away in. Please don’t ruin the lounge experience for everyone else by being loud on your phone…I’ve got a story about that I will share in another post. If you do not have the time or the inclination to sit down for a meal, a buffet offers a wide assortment of soups, salads, breads, cheeses, meats, as well as seasonal hot and cold dishes. I did not sample anything from the buffet. You’ll see why below. As I entered the lounge, I noticed a juice bar…so LA. So great. Several juices and smoothies are available. I enjoyed a glass of “the LA green stuff” as the woman preparing the drinks called it. It was Naked Green Machine…not exactly as healthy as it looks, but quite delicious. You can garnish your juice or smoothie with fresh berries. I loved this amenity, though was sad to see it was gone by around 10:00AM. I had time not just for one meal, but two…so I got to sample six different menu items (and had to be wheeled to the plane in a wheelbarrow…). Actually. portions are small and multiple entrees are encouraged. The dining room is also quite small, but it never got so full that there was a wait for a table. A menu is posted outside the entrance, though your server will also give you a menu. For breakfast, I ordered a Nutella-filled croissant, a “power green smoothie bowl” with granola, and chilaquiles for my main course. The Nutella croissant was massive—a meal in itself—and I ended up eating only half of it. It was tasty but would have been even better had the croissant been warmer and flakier. The smoothie bowl was a pleasant surprise: it turned out better than I expected. The mix of coconut granola, bananas, and berries made for a nice combination. Finally, the chilaquiles were quite tasty. I would have liked to see a bit more eggs mixed in, but this unhealthy little treat hit the spot. I enjoyed a glass of fresh-squeezed orange juice with breakfast and did not enjoy a cup of freshly-brewed cappuccino. The milk foamer must not have been working because it tasted more like a milk coffee than cappuccino. I promptly switched to espresso. After a few hours, I retuned to the dining room for lunch. I started with an “avocado and burrata tower” which had a Soviet look to it (read my review of being stuck on a Soviet mining island in Svlarbard) but was very tasty. The crostini was soggy and should have been served hot and crisp, perhaps with some cheese on top. Next, I ordered a pasta course of butternut squash risotto. I wasn’t a fan of the shaved squash mixed with the rice, but the sauce was pleasant and I liked the sliced green apple and sage on top. Finally, the street taco trio arrived. One taco included diced nopales, pico de Gallo, queso fresco, and tomatillo salsa. Delicious. The next one contained citrus achiote-marinated carne aside, onions, and cilantro. Bravo! The final taco contained soy-seared ahi tuna, avocado cream, and pickled vegetables. Belisimo! This was—by far—the highlight of my dining experience. I’ve had much better risotto, but the tacos were so good I almost had three more. Oh, one more thing. For dessert I ordered red wine-poached pears in carmel sauce with vanilla ice cream. All three dessert choices sounded inviting, but this was an outstanding choice. Service was excellent throughout the entire lounge and the employees—both United and non-United—seem very proud of the new lounge. I was served by Natalie for both breakfast and lunch in the dining room. She provided prompt and excellent service, was knowledgeable about the menu, and remembered my name when I returned for lunch. Other attendants roamed the lounge offering samples, like a tart with fresh berries and whipped cream. On my way in I was warmly welcomed and on my way out I was sincerely thanked for my business. A pair (yes, only two) of sleeping rooms are available if you are tired or have a longer layover. Six shower suites are available and include Saks Fifth Avenue towels, slippers, and plenty of room to move around. Private all-gender restrooms are available near the dining room. A green light above the doorknob indicates the bathroom is empty and a red light indicates occupied. United sets the standard for business class lounges with its network of Polaris lounges. The LAX lounge is another jewel in the crown. A real United boy huh? So many items about United. As much as Lucky is emotionally tied to AA. That’s right. Most smart people who don’t want to drop money for paid business tend to concentrated their efforts on one carrier and my focus has been on United for 15 years. Fair enough. Unfortunately I have no access to US signup bonuses so I have to pay many of my tickets. Nice review Matthew. Enjoyed all the pics. The Polaris lounges actually have me thinking about switching some business to United. “Actually. portions are quite small and multiple entrees are encouraged. May want to rephrase. Again, thanks for the good write up and enjoyed the review. Great review! I do wonder what it would be like during the late night MEL and SYD departures, since the dining room would likely be very popular. I can’t imagine that it’d be enough space to handle all those passengers. Also, it would’ve been nice if you had photos of the “regular” shower suites and toilets instead of the accessible ones, just to get a better sense of their typical sizes. Agree on the universal outlets. That’s a good point and big missed opportunity. I’ll photograph a regular shower suite next time. I honestly didn’t know that was an accessible one. That was the random one I went into it. Too bad you couldn’t share the 5 hours with someone. It was a productive five hours! When you say at most you’ll see 96 people in the lounge, what about connecting flights to SFO, ORD, etc, where folks are flying onward in business? Wouldn’t that account for some portion of the folks there? A very detail review! Thanks. United should utilize this Polaris lounge more by offering more long-haul flights from LAX. Restoring UA operated flight from LAX to FRA and HKG will be a good start. Do you have any insight as to when the LAX Centurion Lounge will open. AX said “sometime in 2019” and since it is now 2019, I wonder if will be soon or late 2019?? Great review by the way!! Great review on the LAX Polaris lounge. Is there a charge for the breakfast and lunch buffets? Hi thank you for sharing the article. Would you happen to know what time they end the dinner service? Or what time they stop servicing food period? Food is available until the lounge closes (after the Sydney and Melbourne flights depart).